Fish tacos always sound good to me. I could eat them at least 3 days a week and not get tired of them. We decided to kick up our recipe for these grilled fish tacos a notch by making them spicy, and OH MY gosh, did they ever turn out spectacular. 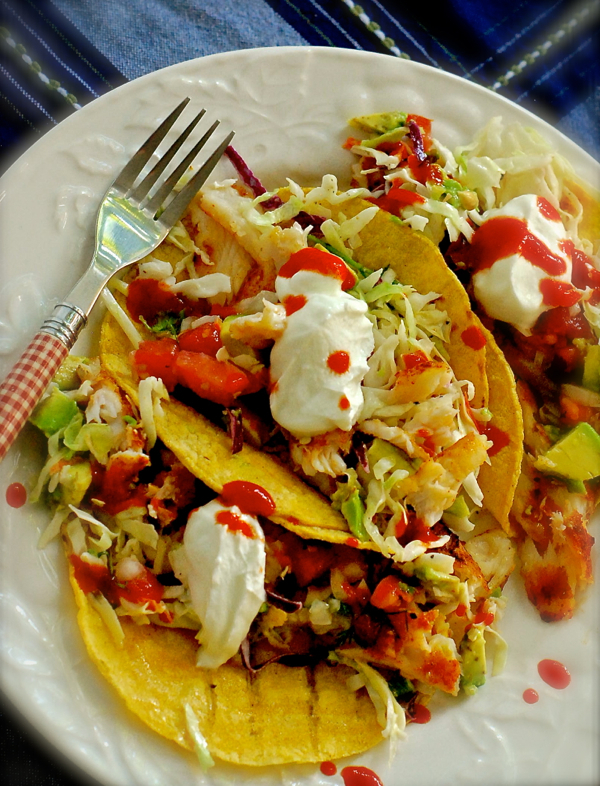 We named them “firecracker fish tacos” for their spiciness and for the upcoming 4th of July holiday! ~ Grill 2 lb. fresh, mild fish (such as cod or haddock) that has been rubbed with a generous amount of chili powder and smoked paprika, and a sprinkle of cayenne pepper and chipotle powder. ~ Grate 8 oz. of pepper jack cheese. ~ Stuff warm tortillas (we grilled ours) with cheese, fish, slaw, tomato/garlic mixture, avocado and sour cream or greek yogurt. ~ Squeeze fresh lemon or lime juice over the tacos. ~ Season with plenty of Sriracha hot sauce if you like your tacos extra spicy. Looks so yummy. I would add cilantro! Love fish tacos. My favorite Greek restaurant has a grilled tilapia fish taco with greek slaw, and a spicy sauce. I like ther Greek pasta salad as a side. Now I have a different fish taco to try. I used to think that was an odd way to make a taco, but I am a total convert. So good and flavorful, a fun dish.